ARF Investment Brokers & Insurances Ltd has come together with Cliona’s Foundation to raise money to help families with critically ill children in Ireland. 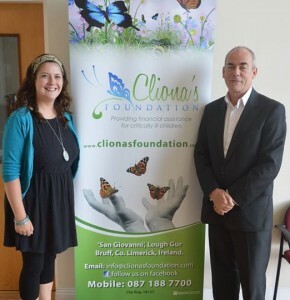 Cliona’s Foundation was recently approached by Basil O’Mahony from ARF Investment Brokers and Insurance Ltd who wanted to find a way that they could start making regular donations to the Foundation. ARF Investment Brokers have agreed to contribute 50% of the first year’s premium to Cliona’s Foundation on any renewal of an existing or new Life policy / Mortgage protection policy or 50% of commission on Investments or Pensions taken out with them. Joe Blog has an existing Life policy / Mortgage protection policy that costs €50 a month annual cost is €600.Joe Blog changes his existing policy to a new life office at the same cost through ARF Investment Brokers & Insurances Ltd. A donation will be made to Cliona’s Foundation from ARF Investment Brokers & Insurances Ltd of €300 over the first year of your new policy. Simply put this means you can greatly assist Cliona’s Foundation at no extra cost to you by switching your existing policy or new policies to ARF Investment Brokers & Insurances Ltd.
Why not email or phone Basil for a quote at email [email protected] or Phone Basil at 087 2839469. Please tell a friend about this offer as every new policy will make a difference to Cliona’s Foundation at no extra cost to you.